For the first time, in this 10th year, I looked into working out loud. You can download a copy of Dennis Pearce’s thesis (University of Kentucky) Developing a Method for Measuring ‘Working Out Loud‘ (immediate pdf download) published in 2014. You read the blog of John Stepper, author of Working Out Loud (published in 2015). You can simply do a search on the internet “working out loud” or search Twitter using the hashtag #wol. There’s lots of stuff out there, but I wanted to know what’s really happening. So I asked the following question on this year’s survey- The Organization in the Digital Age 2016. People were asked to agree or disagree with the following statement using a 5-point scale. Teams willingly make their work visible to the larger organization as they work, and before the work is finished. They “work out loud” through continual, ongoing use of internal communication channels. The results show that out of the 300 participants in this year’s survey population, 30% say working out loud happens in their organizations. 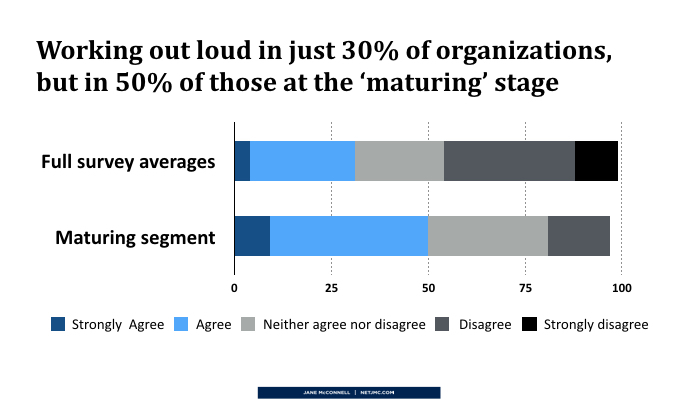 When we look at the maturing segment (as defined by having over 550 points out of a maximum of 900 on the maturity scorecard) we see a much higher proportion—50%. Still, there’s the other half where working out loud is not yet a practice. What do you think? Are those figures high or low?